From school groups to US senators, visitors to NASA JPL’s Earth Science Center gain a new understanding of our planet through data-based storytelling on a GeoDome Globe. 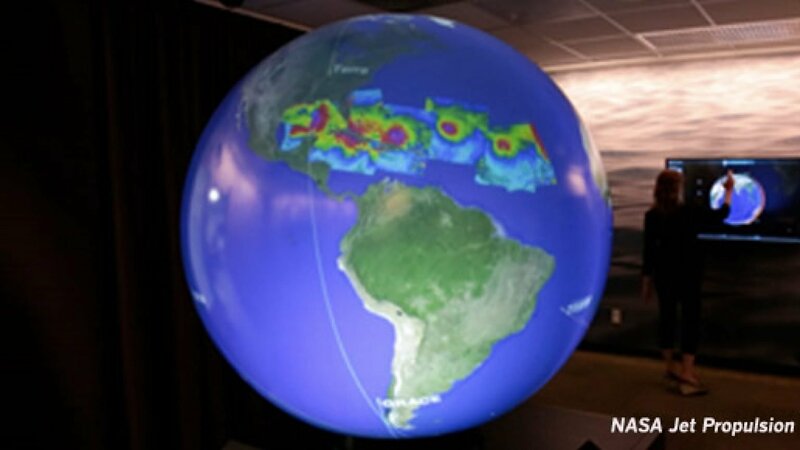 They interact with real-time mission data, monitoring the Earth’s vital signs with Eyes on the Earth. We’ve collaborated with JPL for several years as they’ve developed the Eyes interactive tools, which also include Eyes on the Solar System and Eyes on Exoplanets. Our Omnity plugin and development collaborations enable the Unity3D-based Eyes platforms for spherical display on domes and globes, and support streaming live to YouTube360 to share VR views with a broad audience. We’re also a distribution partner, bringing the Eyes platforms to immersive VR installations in 30+ museums, planetariums, and more – including the Smithsonian’s National Air and Space Museum, the Bell Museum, and ASU’s School of Earth and Space Exploration. 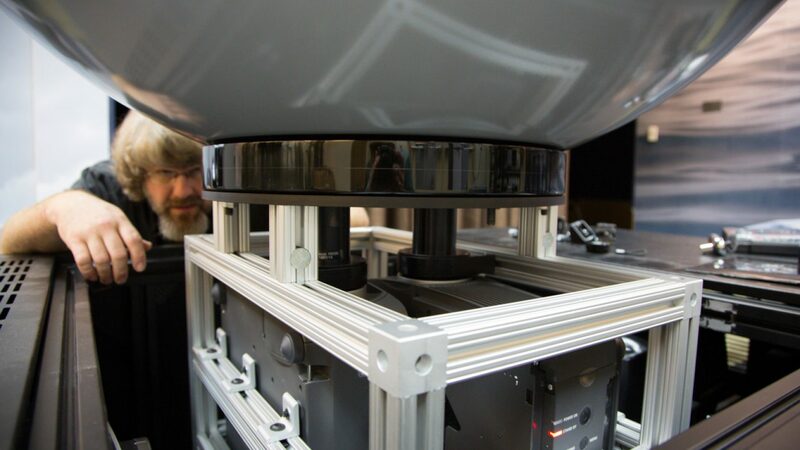 The 4’ globe in the ESC is driven by an OmniFocus projection system, two edge-blended laser projectors with 1.9 Mpix resolution at 12,000 lumens. Our folded 200 series lens allows the globe to sit close to the floor, so the equator is at eye level for most visitors to facilitate exploring the Northern Hemisphere. The laser projectors were installed in 2016 using the lenses we provided in 2012 as an upgrade to an existing Magic Planet. Our lens design has made it easy for JPL to stay current as projection technologies evolve. We’ve also worked with JPL to create a unique way to engage with multiple displays from a single user interface. 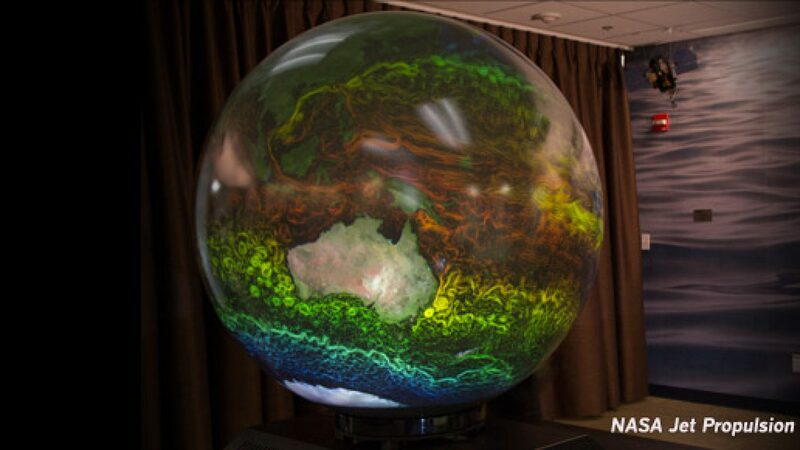 WorldViewer works as a centralized tool for managing content on the ESC’s multiple interactive displays, including the globe, a 9×9 video wall, a 4K 3D Theater, and wireless Surface tablet. Switching between audience-driven interactivity and docent presentations using the wireless UI lets the ESC presenters create a seamless experience for audiences as they flow through the various displays. WorldViewer’s texture sharing capabilities make it simple to launch multiple applications through a single user interface, and it’s easy to configure GUI elements with our visual editor, WorldComposer. Finally, we provided image generating computers configured for JPL’s use requirements for both exhibits and content development.